What is astral body? There are three types of body: physical body, astral body and the causal body. Astral body is associated with the emotional body. Frequency of the astral substances are much higher than the physical matters. Astral body is directly associated with the emotional intelligence. The astral body is the carrier of the life force. What are the astral nerves? Astral nerves are the subtle passages through which the vital energy moves. In the previous article, I discussed about Chakra Meditation and Brainwaves. Here, I will discuss about the astral nerves in the body. Chakras are the sacred energy centers in the body. There are thousands of subtle energy centers in the body, but seven of them are very prominent. In yoga system it is believed that there are nearly 72,000 nadis in the human body. These nadis are the invisible astral nerves in the human body. Life energy (Prana or Chi) moves through these astral nerves and the chakras are like power stations. The chakras are the psychic energy source in our body. The chakras pump the excess energy out of the body. They may also attract energy from other chakras for maintaining their own station running. There are three major astral nerves in our spinal chord. The left-side nerve is known as “Ida” (Mind) and the right-side nerve is known as “Pingala” (Body). In the middle, there exist the third major astral nerve, which is known as “Sushumna” (the Self). Sushumna moves inside the spinal chord. Normally, this astral nerve is in dormant state. The purpose of chakra meditation is to activate this major astral nerve. Chakra balancing is the synchronization of different glands and nerve centers corresponding to the different chakras. It is also the synchronization of various parts of the brain. These synchronization occurs as we focus our attention on various chakras in appropriate sequence. Chakras are associated with our physical, mental and emotional states. When energy does not flow freely from the Chakras, the body does not function properly. We need to re-establish the free flow of energy in order to heal the body and mind. Each of these, major seven chakras is associated with one of the seven endocrine glands. Hence, when the chakras are in balance our glands are in balance. Our body, mind and spirit are in balance. In addition, chakras will be in balance, when we are in sync with the universal life energy. Chakra balancing is the art of aligning, harmonizing and vitalizing all the seven energy centers within the human body. 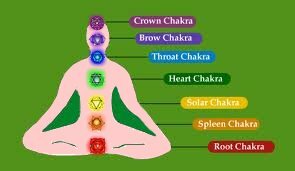 Chakra clearing is the removal of energy blockages in the astral nerves and the chakras. There are various methods for clearing the chakras. Meditation is the easiest and the most proven method for clearing the chakras. The next post discusses on Chakra Meditation for Opening the Heart Chakra. This entry was posted in Articles, Chakra Meditation, Hindu Meditation, Mantra Meditation, Meditation and tagged 72000 nadis, astral nerves, chakra balancing, chakra clearing, chakra meditation, chakras. Bookmark the permalink.